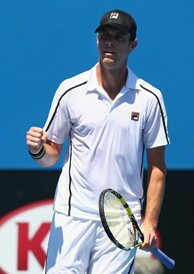 Sam Querrey celebrates a point during his first-round win over Santiago Giraldo at the Australian Open. MELBOURNE, Australia -- Sam Querrey may appear to be a laid-back character, but just like every other human being, he doesn't take everything in life in stride. Early last summer, after the breakup of his engagement with his fiancée, he found it difficult to find his motivation. That cost the former Top 20 player for the rest of the season. A seven-time title winner, the 26-year-old Querrey spoke the truth about his summer, as he only had one good event -- reaching the semis of the Emirates Airline US Open Series event in Winston-Salem, N.C. Adrian Mannarino upset him in the second round of the US Open in a contest he felt he should have won, but about a month and half later, he managed to get his head back into the game. In Beijing, he took out Russian veteran Mikhail Youzhny and upended US Open semifinalist Stan Wawrinka, before going down to former US Open champion Novak Djokovic. “In the summer, I was pretty much out of it, but by Beijing, I felt like I was getting back,” he said. However, Querrey suffered an abdominal injury and was forced to shut it down for the rest of the season. But that break did have its benefits. He did “nothing" for four to five weeks and, for the most part, hung at his place in Santa Monica, Calif. At first, his injury didn't even allow for a modicum of exercise. “I’d drive to Starbucks, and it’s right down the street,” he said with a laugh. Querrey would wake up when it suited him, walk around his neighborhood for a couple of hours, hang out with friends, listen to music, go to movies and also to concerts, where he saw Jay-Z, Drake and the band The Neighbors, which is a group that originated at his former high school and is managed by his best friend. Currently ranked No. 51, Querrey would like to re-enter the Top 20, but his bigger goal is to crack the Top 10 for the first time. He is excited about the U.S.'s upcoming Davis Cup tie in San Diego against Great Britain, which he believes his squad has a good shot to win. If he, John Isner (who pulled out of his first-round match at the Australian Open with an ankle injury) and the Bryan brothers are all healthy by the time the tie rolls around in two-and-a-half weeks, Captain Jim Courier has said that those four will more than likely make up his team again. Querrey and his good friend Isner have been the only two players to have cracked the Top 20 since Andy Roddick, James Blake and Mardy Fish stopped playing, and they are often called the U.S.'s greatest hopes at the majors. Querrey says he does not feel that pressure but is hoping that the United States will soon fill the rankings list with more notable players. Querrey says that one of the keys to his season is to enjoy his tennis more, play looser and with more freedom. Moreover, the 6-foot-6 banger needs to push the ball around, or he will never reach his goals. Even though he was forced to retire with an ankle injury after dropping the first two sets of a 6-2, 7-6 loss to Martin Klizan, John Isner believes he will be good to go for the U.S. Davis Cup tie against Britain at Petco Park in San Diego. "I feel like I will get over (this injury). It doesn't concern me as much as some knee issues I've had in the past," he said. "I fully intend to get ready for Davis Cup." Alison Riske has followed up her outstanding run at the 2013 US Open, where she reached the fourth round, by upsetting No. 23 seed Elena Vesnina, 6-2, 6-2, in her first-round match in Melbourne. Riske believes that she is a better all-around player and next faces Yanina Wickmayer. Irina Falconi has spent a lot of time during the past five months playing circuit events in Australia and was thrilled she got into the main draw as a lucky loser, where she took advantage and defeated Anabel Medina Garrigues, 6-3, 6-1, in the opening round. She next faces No. 22 Ekaterina Makarova, who took down Venus Williams in her first-round match. “The moment I got the email I was so happy. I was shaking for two hours,” Falconi said.